When I was a kid, I had maybe three goals in life. The first goal had something to do with owning a better skateboard than my best friend. The second goal probably had something to do with crushing my sister’s dreams of marrying Leonardo DiCaprio. The third, and most important goal in my young mind was to one day fly in a B-17. I begged and pleaded with my parents to make it happen. I heard nothing but one ( completely legitimate) excuse after another. It’s over. There was no hope. And then 19 or 20 years later, I receive a random e-mail at work asking if I’d like to go up in a B-17 as a member of the media. You’re telling me there is a god? I immediately called the contact who sent the e-mail, perhaps being overly enthusiastic at times while he reassured me that, yes, you are scheduled to go up in a B-17 in a few days. As journalists and editors, we’re trained to act indifferent in all situations. I totally blew it on this assignment. When the day finally arrived, and I stood there admiring the plane reflecting sunlight as the flight crew rattled off safety tips and interesting historical tidbits, I realized this was actually going to happen. View from the nose of the aircraft. 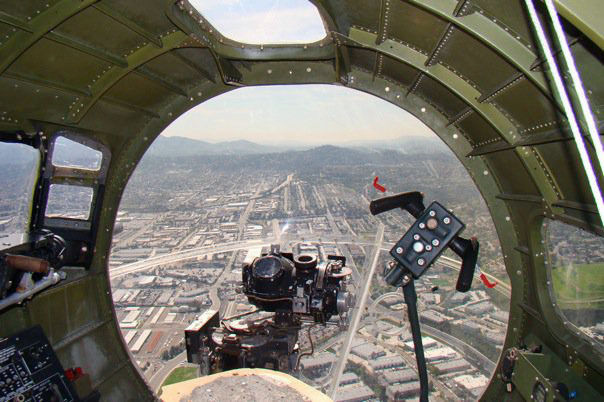 We climbed aboard and took our seats in the waist gunner section of the aircraft. A cloud of smoke reeking of gasoline poured into the fuselage as the pilot fired up the first two engines. As a kid, I would’ve thought the smoke was just the icing on the cake. But as an adult, I couldn’t help but think about the young men—men my age—who risked it all each and every time they boarded the aircraft. Something tells me they weren’t as excited as I was to fly in a B-17. This was a dream come true for me. Which brings me to my next point. It just might take 20 years to accomplish one of your goals in life. Hey, you never know when you might receive that random e-mail or phone call. What’s one thing you’ve always wanted to do since you were young, but were only recently given the opportunity to do so?